Upcoming Mozilla Firefox 4 version’s mock up theme can be altered to shoot Firefox 3, while Friefox 4.0 getting its time to near, there are some themes for it, using mockups Mozilla. Instead waiting to avail it we can use and enjoy the themes applying it with Firefox 3 with an add-on untill. Strata40 theme is designed to mimic the look and functionality of the Firefox 4 mock ups, the theme for Firefox works with version 3.5 and above, a combination of other add-ons and user scripts will give the complete look and feel of Firefox 4 mock up theme although the Strata40 theme gives the mock up effect. 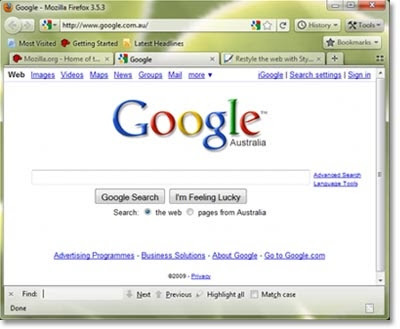 Omnibar - Search functionality to the address bar.